This ongoing post contains swatches of Milani Baked Blushes (Bella Bellini, Bella Rosa, Bellissimo Bronze, Berry Amore, Corallina, Delizioso Pink, Dolce Pink, Luminoso, Rosa Romantica, Rose d’Oro) and Rose Powder Blushes (Coral Cove, Romantic Rose, and Tea Rose). 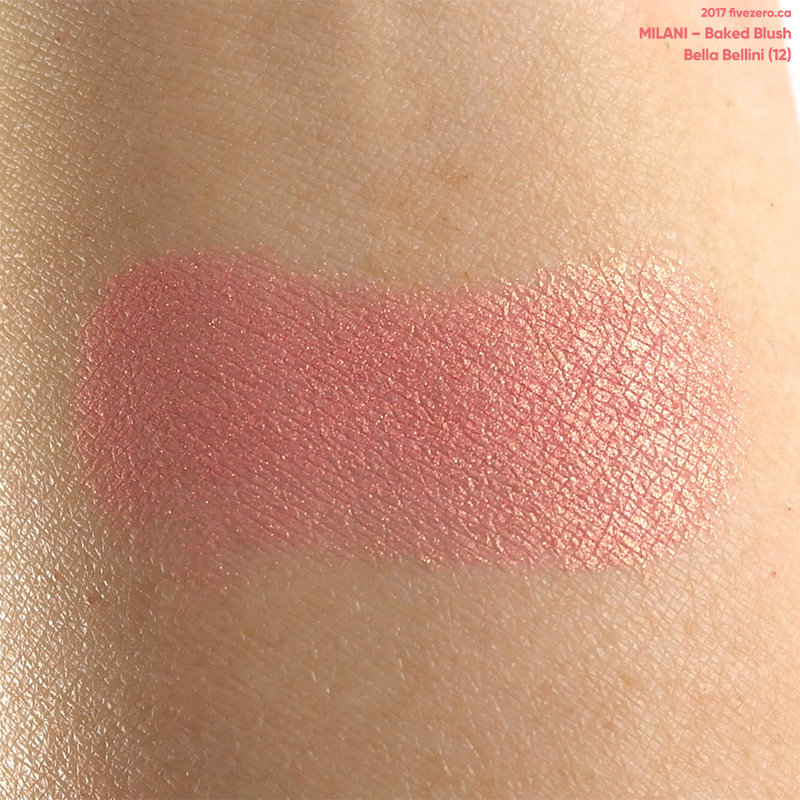 I will update this post with any new Milani blush swatches, as well. 2017-09-25 Bella Bellini & Rosa Romantica added. These blushes are awesome, period! It’s just a bonus that they come pretty cheap, as well. Granted, the packaging leaves a bit to be desired, but when I pick these up at a little over CA$6 a pop on sale, I’m not complaining! These are a bit shimmery for blushes; out of all of mine, only Bella Rosa and Delizioso Pink are matte. Luminoso is not overly shimmery. Bellissimo Bronze is sparkle city. Berry Amore, Corallina and the legendary Luminoso are my faves. Admittedly, I have been too chicken to try Bella Rosa, yet! Milani Baked Blush is US$8.49 / CA$7.99 (I have no idea why it’s cheaper at Well.ca!) and 0.12 oz / 3.5 g. It is made in Italy. Baked Blush — Bella Rosa (11). Baked Blush — Bellissimo Bronze (06). This is more shimmery in person! The sparkles got washed out in the photo. Baked Blush — Berry Amore (03). Baked Blush — Corallina (08). Baked Blush — Delizioso Pink (10). Baked Blush — Dolce Pink (01). 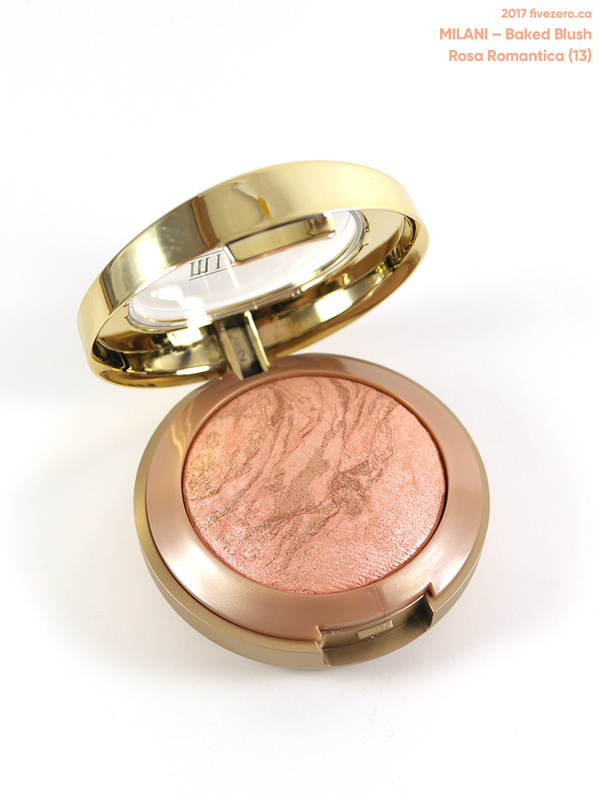 Baked Blush — Luminoso (05). 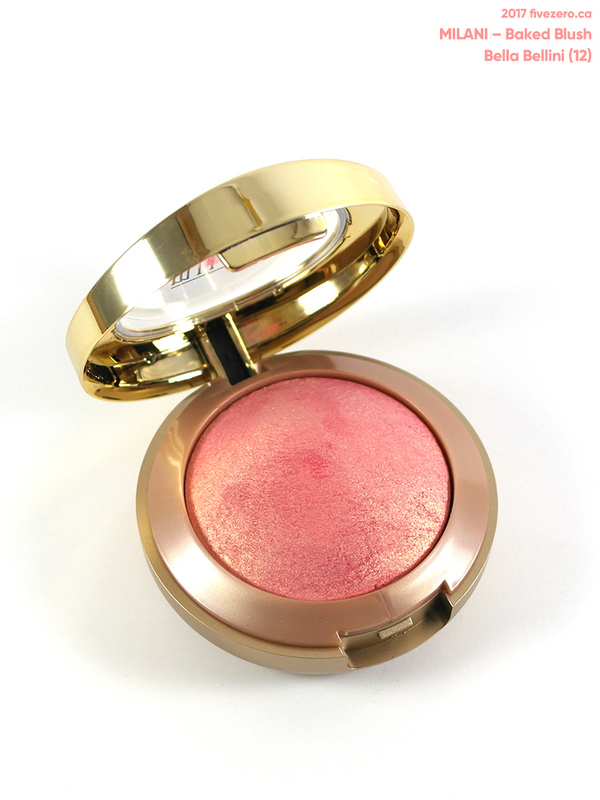 Baked Blush — Rose d’Oro (02). Baked Blush — Bella Bellini (12). See the full review here, with comparison swatches. Baked Blush — Rosa Romantica (13). Unlike the Baked Blushes, these do not have a mirror and brush included in the packaging. Gotta say I much prefer the packaging of the Rose Powder Blushes, though. Much slimmer and prettier. Milani Rose Powder Blush is US$7.99 / CA$7.99 (I have no idea why it’s cheaper at Well.ca!) and 0.6 oz / 17 g (this is a whopper compared with the Baked Blush at 3.5 g!). It is made in Italy. Rose Powder Blush — Coral Cove (05). The swatch is actually much brighter in person; it has a touch of neon vibrancy to it and my camera didn’t capture it well (kind of the way neon nail polishes get washed out in photos). Coral Cove isn’t actually neon, mind you. Just bright! Rose Powder Blush — Romantic Rose (01). Rose Powder Blush — Tea Rose (08). Milani Cosmetics is based in Los Angeles, CA, USA. The company is cruelty-free. I can’t handle the shimmery / glittery-ness of most of the regular line. The only tolerable one is Luminoso. Berry Amore is also ok in terms of shimmer. I really hope Milani releases more matte ones! The Rose blushers are 17 grams? Wow, that’s more than pressed face powder or bronzers! I love how all of these are made in Italy! Such bargains. I think I need Coral Cove and Romantic Rose. How similar would you say Romantic Rose is compared to Illamasqua Naked Rose? No way, how funny! 😀 I gotta try it some time. I have a couple of these really bright blushes that I haven’t dared to try yet (Bella Rosa, MAC Frankly Scarlet). But yes, they definitely need more matte(ish) shades. When I tried Bellissimo Bronze for the first time, I looked like a disco ball. But overall, super nice blushes, esp for the price and quality. I have to give Romantic Rose a try next to Naked Rose; perhaps tomorrow! Agreed! I thought I was the only one who didn’t like the regular blushes. Way too glittery! So jealous!! I want them all!! 😦 I only have Luminoso but I’ve been dying to try all the rest of the shades and your post just tempted me even more! ❤ Also the Rose blushes are too cute! The packaging is gorgeous I can’t resist the flower lol! The rose blushes are adorable! 🙂 Which blushes are you thinking of getting? 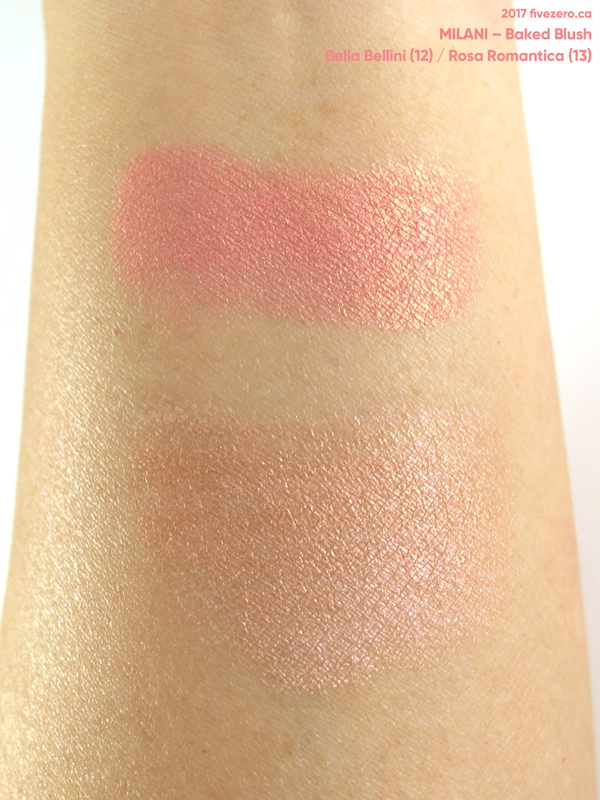 The pigmentation on the Milani Baked Blushes is great! You’d think these were high-end products, apart from the packaging. #teamluminoso! But the rose ones are so pretty and I do like their packaging more. Luminoso’s becoming a real classic! If only Milani would package the Baked Blushes in compacts similar to the Rose Blushes. The Baked Blushes are so fat and take up too much space. I know!! Omg I was trying to fit all the blushes during wintertime into a makeup bag so I can rotate blushes and luminoso was not having it. I have been eying these for a while. You might have convinced me! The roses are too pretty. For the price, they’re easy to pick up just for the cuteness factor!